India needs to rapidly step-up its cyber security efforts by building sophisticated cyber intelligence and response capabilities along with ensuring a steady supply of skilled cyber security professionals to compliment the investment in technology and security infrastructure. 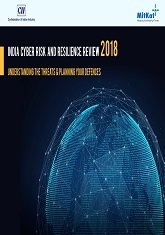 The India Cyber Security & Resilience Review 2018 is intended to present research, insights and perspectives on the current cyber security landscape while exploring potential defence mechanisms against committed and sophisticated adversaries. This report was unveiled during the Conference on Securing the Cyber Space at the Global Exhibition on Services, held from 15 - 18 May 2018 at Mumbai.